(CNN) -- South Africa will host the FIFA World Cup in June and July, and Cape Town's gleaming new Green Point Stadium is one of the two semifinal venues for the quadrennial soccer championship. Cape Town sits at sea level at the foot of Table Mountain on the Cape of Good Hope. Its most significant historical landmark may be the notorious Robben Island prison. 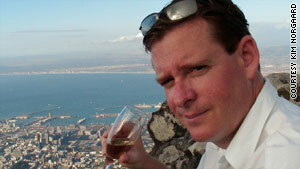 Kim Norgaard, CNN's bureau chief in Johannesburg spent the early part of his life in Cape Town before moving overseas. "I try to get back to the 'Mother City' as often as I can," Norgaard said. Where can you get the best view of the city? Cape Town is blessed with amazing views -- you can either see the ocean, the iconic mountain or what is called the City Bowl from most areas. Just take your pick depending on the weather and wind. The most stunning is always from the top of Table Mountain on a clear day or atop Signal Hill looking down at the City Bowl. From both spots you can see Nelson Mandela's prison, Robben Island, and get a real sense of being at the tip of Africa. Further south and you are in Antarctica. Which restaurant would you take your loved one to for an anniversary or other special occasion? Cape Town is Africa's gourmet hotspot as the best vineyards this country offers are within an hour's drive. Kim Norgaard relaxes on top of Table Mountain in Cape Town, South Africa. Staying in Cape Town, my favorite special occasion restaurant is La Colombe at the Constantia Uitsig winery. There is also a more casual River Café at the winery ideal for a lazy lunch and wine sampling. If in the wine country, my personal favorite is Le Quartier Francais in Franschhoek. This restaurant continues to receive awards as one of the best in the world. For a more relaxed dinner or lunch, try Wakame in Mouille Point. Just sit and watch the sun set over the Atlantic while enjoying local seafood and white wine. Doesn't get better than this. If you want to look at tourists go to the V&A Waterfront. But if you want to see the locals, with all their blemishes, hang out at Hout Bay waterfront or Long Street in the city. Anywhere within the City Bowl. The mountain always looms behind and the sea in front. Melissa's in Kloof Street is a great neighborhood spot for lunch and people watching. How do tourists stick out and what's the best way to blend in? They are unprepared for Cape Town's changing weather. Winter is cold, rainy and windy. Summer evenings can be brisk and chilly. So always come with a good variety of clothes. Otherwise you might be that tourist freezing in his flip-flops, T-shirts and shorts. What's the biggest misconception about your city? That somehow Africa is backwards. Cape Town has the most amazing contemporary art scene and some of the greatest modern designers. It is a hub of creativity. Don't just get stuck buying cheap tribal masks. Instead, go to Woodstock and explore the original designs at the Haldane Martin, Gregor Jenkin or Whatiftheworld studios. Kirstenbosch Botanical Gardens and Constantia just around the corner. There are many botanical gardens but nothing quite like Kirstenbosch. If you just want to walk, have a picnic, listen to a concert or just enjoy life in the southern tip of Africa, this is the place. What essential thing should visitors see/experience if they only have a few hours? Go for a drive and really enjoy the majestic scenery that the city offers. From the airport drive through the city, enjoy the mountain looming over it and head over to Camps Bay. With the Atlantic Ocean on your right drive past Llandudno and then all the way to Hout Bay. Now you are looking at the Indian Ocean. From there take the inland route through Constantia -- a suburb that is home to some of Africa's oldest vineyards. What's the biggest tourist trap? Is there a "tourist trap" that's actually worth seeing? The V&A Waterfront is just another shopping mall but in an amazing location. However, you need to go there to take the ferry to Robben Island. Visiting the prison on this island where Nelson Mandela spent many years is a must to understanding where this country has come from. Just make sure you book ahead of time. Where was your most memorable meal? At the Cellar Restaurant at the Haute Cabriere wine estate in Franschhoek. Every meal was matched to one of their wines and the lunch lasted for hours. I can't quite remember what was paired with our desert or receiving the bill but it a memorable meal nonetheless. Where's your favorite place to spend a night out on the town? Go to one of the great restaurants and then head home to enjoy one of the cities many boutique hotels. My personal favorite is a small bed and breakfast, run by a British couple, called twentytwo. Sitting in the hip lounge for a nightcap after a dinner is special. Are there local specialty dishes or drinks that visitors must try? The local wines. Klein Constantia has always been one of my favorite vineyards as they consistently deliver great quality. Also, it is always a sentimental visit for me as I grew up nearby. What is a good local souvenir? If you want a really memorable souvenir that isn't a wooden giraffe, go for good local design such as a Haldane Martin ostrich feather lamp or Zulu Mama chair. A great place to find other locally produced art is the Cape Craft and Design project by the city. They can direct you to the unique local designers.